I was able to get some play time in, but it was severely limited. However, limited time is better than none at all! I dabbled across 5 professions – ranger, mesmer, thief, guardian, warrior – spending the most time on the ranger. I liked what I saw, but didn’t play enough to offer deep insights or constructive criticism. The animated map. Not just the fly-into-zoom feature, but the scrolling and updating and circling/highlighting various quests spots. Public quests. Reminiscent of Warhammer Online, these were joinable by being nearby, and were great fun. At the end, by what I assume is damage dealt to mobs, I was awarded Gold or Silver medals for my participation. I’m not sure what the really meant as far as loot, but it didn’t matter since I’m sure the mechanics will be further tweaked. Instancing. I was so used to only having other players around when in a city zone (which is how Guild Wars worked), it was a lot different to play the regular content with others not in my party. But some points in a quest line required entering an instance, which was largely seamless. What was extra cool is I had to suddenly log out in the middle of one – later when I returned and logged in, I was outside the instance and greeted with a “would you like to continue” prompt. That is awesome, speaking as somebody who sometimes can’t block off hour after hour of uninterrupted playtime. Map travel. 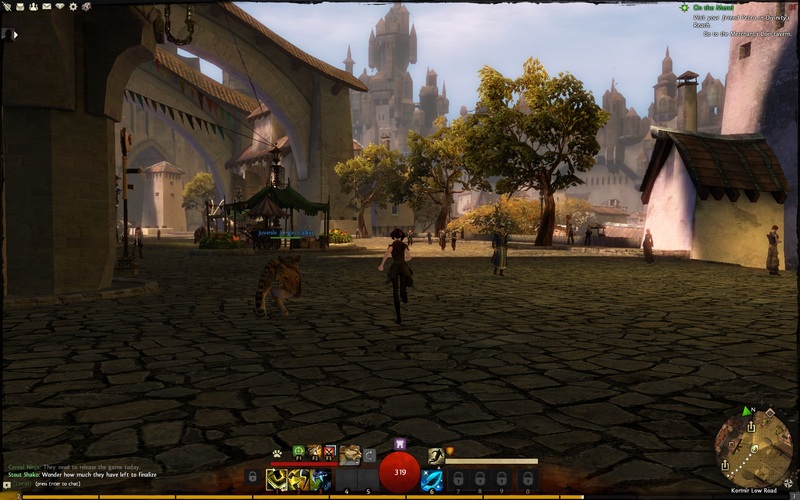 In Guild Wars, you could instantly travel to any outpost or city you already visited. I didn’t get very far over the weekend, but I saw that you could map travel to nearby points – some cost money and some didn’t – and that is nice to have. Convenience features. By this I mean I didn’t have to click or select an NPC to talk to them, or a slain foe to search for loot – merely moving close by triggered a floaty “[F] talk” (or something like that) message. Downed/Defeat. In GW2 when you lose your health, you don’t “die” and become a ghost or respawn somewhere else. Instead, you fall to the ground (at that spot) and have a small selection of profession specific skills available; typically you can still fight a little bit, call for help, etc. This is similar to a LoTRO defeat except you can do something during the countdown. I’m fuzzy on the specifics but this look like a great innovation. Well, that’s a whole lot to like in the brief time I played… I hope they hold future beta weekends AND that I can play for a few hours. I decided to refresh my EVE memories by watching the How to Survive EVE Online video series by Seamus Donohue of EVE University. I’ve been pecking away at them, watching a few each day, and recently finished up. That was a huge undertaking, recording and narrating 45 (!) videos for new players. I’m glad people like him play the game and are willing to put so much time into spreading information. While I consider what sci-fi MMO to try, I decided to move along Naerys in LoTRO. I had quested to Trum Dreng and has been helping the tribe there for… well basically since the expansion rolled out last September. So I wrapped things up and received two quests: one to the Bonevales, and one to Galtrev. I decided to hurry to Galtrev and continue from there, and come back to the Bonevales some other time. Perhaps what I’ll do is take Dhrun into Dunland via the Bonevales, so I see those quests but on a different character. It’ll be a while though, Dhrun is back in Enedwaith at Echad Dagoras. Once in Galtrev, I, Naerys, World-Reknowned Hobbit Guardian, helped out with a variety of menial tasks such as collecting nails and serving messenger duty. Such is the life of an adventurer. 😉 I stopped there and will return to Middle Earth far more regularly. I played EVE Online for 18 months or so. Well, more like 9 or 10 months, since the last half of my playtime was largely me logging in long enough to fiddle with my skill queue. Still, I remember that the PvE combat wasn’t terribly exciting. Syp’s comment on a Massively post, about how EVE Online is “mindless circling and autofiring” reminded me that yeah, that’s kinda true, at least for PvE. Of course there is the PvP option, but that would be a very abrupt change. Somewhere between “PVP: very high risk and probably very difficult” and “PVE: too easy” is a happy medium. Perhaps the key is harder agent missions: accepting challenging missions in lower security systems. On the other hand, how much should “exciting” combat matter, versus exploration content? EVE Online, I think, is unsurpassed in exploration opportunities. I would like to play a sci-fi game, and these days, there are some great options. Fallen Earth looks interesting, as does Star Trek Online, especially since both are free-to-play. Then there is EVE Online, with a monthly fee but honestly that isn’t exactly the barrier. I’d certainly feel more casual about a free-to-play game, which meshes well with the actual available time I am able to devote. But I suppose that even as much as I lean towards reactivating EVE Online, I should give Fallen Earth and Star Trek Online a whirl first, or perhaps even Star Wars: The Old Republic. In my long MMO haitus, I’d lost track of the fact GW2 is nearly ready. This dampens my enthusiasm for wrapping up miscellaneous unfinished business in GW further. I’m at 30 in my Hall of Monuments, and it would require heroic effort to bump that up meaningfully higher… so I’m kinda thinking, why bother. I don’t want to burn out before Guild Wars 2 hits! So instead, today I pre-purchased my copy of Guild Wars 2 – the Digital Deluxe edition. I’m excited, and will be deciding between a Ranger or Mesmer (my favorites from Guild Wars). In the past, I would have started a character of every profession, but these days I need to limit myself more. Two chars should be plenty enough to “see” the game with.